Letter to the Scottish National Portrait Gallery re: BP Portrait Award 2016/17 – BP or not BP? We are writing to celebrate the excellent news that on 6th April, the Edinburgh International Festival announced the end of its 34 year sponsorship contract with BP, stating, “We are grateful to them for their long-term support of the festival, but all sponsorship arrangements end eventually”. On Monday 11th April, our network congratulated the organisers on increasing the momentum towards and transition to a fossil free culture. The EIF has set an excellent example to all arts and cultural institutions still under contract with BP and other big oil companies. We are delighted that Scotland can be seen to be so easily free of the reputational damage that BP brings to this world renowned festival of the arts. We hope that you might now acknowledge our letter dated 27th February 2016 in which we requested a meeting with you to discuss the issue of oil sponsorship, so that we may feedback positively to our supporters and the wider public. The National Portrait Gallery in London has announced that BP sponsorship of the annual Portrait Awards will extend until 2017. We find this unacceptable. 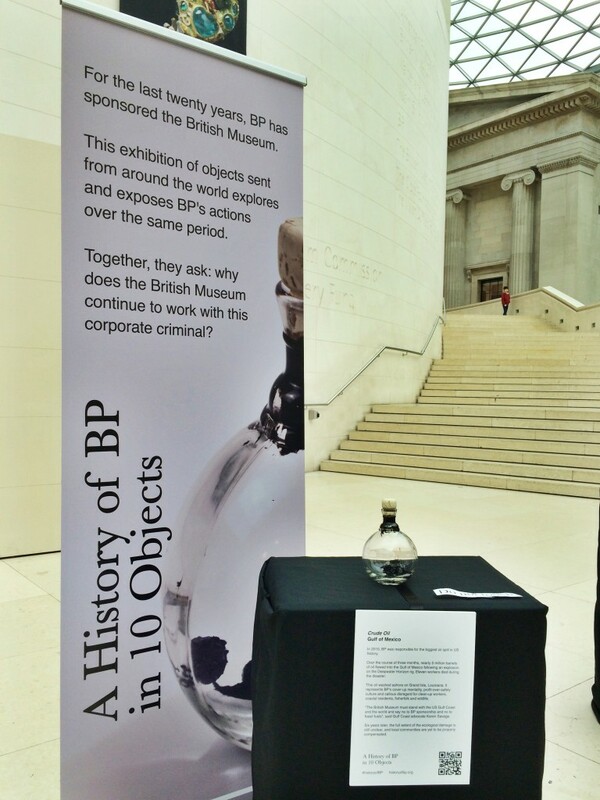 If no respectable, ethical sponsor can be found in support of the exhibition travelling to Scotland, we hope that you will consider denying BP associated publicity or refuse the Portrait Awards a venue. The positive media coverage surrounding the EIF announcement has been a breath of fresh air. The new list of festival sponsors is impressive and their programme is as vital and inspiring as ever. Our letter to the EIF also invited them to join an impressive list of artists and arts professionals already signed up to the Fossil Funds Free commitment. Highly respected cultural institutions such as the Royal Court Theatre in London can now use the Fossil Funds Free logo to signify that their work will no longer be associated with this malignant and dying industry. By helping to create an oil-free cultural sector, this body of progressive individuals and hosts are helping to normalise the sense that we can all live perfectly well without fossil fuels. In the coming week, world leaders will sign the climate deal agreed in Paris in December 2015. The SNP has announced that Scotland will aim for a 50% plus reduction in carbon emissions by 2020. In 2015, BP suffered headline losses of more than $6.5 billion relating to claims arising from the devastating Gulf of Mexico oil spill disaster. At BP’s 2016 AGM last week, Chief Executive Bob Dudley still threatened that BP will “come out stronger”. We would like to see the Scottish National Portrait Gallery and the National Galleries of Scotland send a bold signal to BP that their operations are fundamentally insupportable. Our dependency on fossil fuels has to end and reserves must be left in the ground if we are to prevent the impacts of catastrophic climate change. It would be a remarkable step if your institution could demonstrate the courage and leadership to replace BP branding with the Fossil Funds Free logo and contribute to the movement to a landscape beyond oil. We would welcome the opportunity to talk with you about these matters and look forward to receiving your response soon.